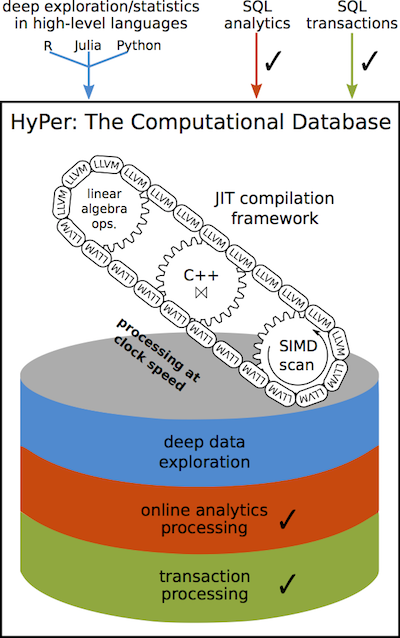 HyPer is a main-memory-based relational DBMS for mixed OLTP and OLAP workloads. It is a so-called all-in-one New-SQL database system that entirely deviates from classical disk-based DBMS architectures by introducing many innovative ideas including machine code generation for data-centric query processing and multi-version concurrency control, leading to exceptional performance. HyPer’s OLTP throughput is comparable or superior to dedicated transaction processing systems and its OLAP performance matches the best query processing engines — however, HyPer achieves this OLTP and OLAP performance simultaneously on the same database state. Current research focuses on extending HyPer’s functionality beyond OLTP and OLAP processing to exploratory workflows that are deeply integrated into the database kernel by utilizing HyPer’s pioneering compilation infrastructure. News: Thank you for visiting HyPer's research site hyper-db.de. The commercial license for HyPer, a spin-off of TUM, has been acquired by Tableau Software, a global leader in rapid-fire, easy-to-use business analytics software. For more information, please visit the Tableau web site. HyPer relies on in-memory data management without the ballast of traditional database systems caused by DBMS-controlled page structures and buffer management. SQL table definitions are transformed into simple vector-based virtual memory representations – which constitutes a column oriented physical storage scheme. Transactions and queries are specified in SQL or a PL/SQL-like scripting language and are efficiently compiled into efficient LLVM assembly code. OLAP query processing is separated from mission-critical OLTP transaction processing using multi-version concurrency control (MVCC). HyPer's transaction processing is fully ACID-compliant. Queries are specified in SQL-92 plus some extensions from subsequent standards. VLDB 2016 How Good Are Query Optimizers, Really? DanaC 2015 High-Performance Main-Memory Database Systems and Modern Virtualization: Friends or Foes? Viktor Leis, Alfons Kemper, Thomas Neumann, 2015. 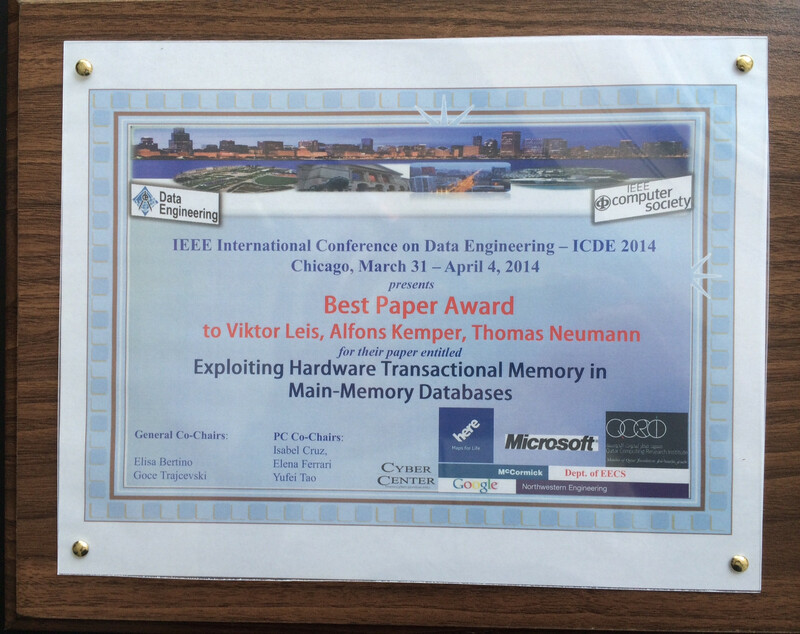 DaMoN 2014 Heterogeneity-Conscious Parallel Query Execution: Getting a better mileage while driving faster! Stephan Wolf, Henrik Mühe, Alfons Kemper, Thomas Neumann, 2013. Harald Lang, Viktor Leis, Martina-Cezara Albutiu, Thomas Neumann, Alfons Kemper, 2013. Holger Pirk, Florian Funke, Martin Grund, Thomas Neumann, Ulf Leser, Stefan Manegold, Alfons Kemper, Martin Kersten, 2013. Henrik Mühe, Alfons Kemper and Thomas Neumann, 2012. Florian Funke and Alfons Kemper and Thomas Neumann, 2011. Dagstuhl "Robust Query Processing" Breakout Group "Workload Management", 2011. DaMoN 2011 How to Efficiently Snapshot Transactional Data: Hardware or Software Controlled? Henrik Mühe and Alfons Kemper and Thomas Neumann, 2011. Guido Moerkotte and Thomas Neumann, 2008. VLDB 2006 Analysis of Two Existing and One New Dynamic Programming Algorithm for the Generation of Optimal Bushy Join Trees without Cross Products. Guido Moerkotte and Thomas Neumann, 2006. February, 2016 HyPer on Cloud 9, Workshop: Databases in the Cloud—What is different? OLAP query processing is separated from mission-critical OLTP transaction processing using multi-version concurrency control. HyPer's transaction processing is fully ACID-compliant. Queries are specified in standard SQL-92 plus many extensions from following standard SQL standards. Contact us (see Team for emails) if you are interested in a thesis, student job or even a Ph.D. position!